Researchers are eager to go beyond simple cements used extensively in construction. They are aiming to create novel construction materials to develop a smarter infrastructure. Mayenite, a type of cement, is a smart material capable of transforming from an insulator to a transparent conductor and back. This cement’s unique properties make it ideal for use as semiconductors in flat panel displays, as well as for industrial manufacture of chemicals such as ammonia. The key to mayenite's magic is a tiny modification in its chemical composition. However, researchers are not able to figure out the reason for such a big impact on the material, also referred to as C12A7. In recent research, researchers demonstrate how C12A7 components, known as electron anions, assist in the transformation of crystalline C12A7 into semiconducting glass. Published in the August 24 issue of Proceedings of the National Academy of Sciences, the research uses computer modeling that zooms in at the electron level along with lab experiments. They illustrated how the minute change in composition causes remarkable changes in the glass properties, and potentially enables better control of the glass formation process. We want to get rid of the indium and gallium currently used in most flat panel displays. This research is leading us toward replacing them with abundant non-toxic elements such as calcium and aluminum. In the past, materials scientist Hideo Hosono at the Tokyo Institute of Technology and colleagues were able to pluck an oxygen atom from a crystal of C12A7 oxide, which transformed the transparent insulating material into a transparent conductor. This change is uncommon as the conducting material is transparent. Most conductors are not transparent (metals), and a large number of transparent materials are not conductive (window glass). Within the crystal, the departing oxygen from C12A7 oxide leaves behind a few electrons and forms a material called an electride. This electride is extremely stable in water, air, and ambient temperatures. Many electrides tend to fall apart in these conditions. Due to the stability, materials scientists want to exploit the properties and structure of the C12A7 electride. However, its crystalline nature is not ideal for mass industrial production, so they had to create a glass equivalent of the C12A7 electride. They did this several years ago. Hosono’s team successfully converted crystalline C12A7 electride into glass. The glass shares several properties of the crystalline electride, including the outstanding stability. Compared to glass, which is unordered and messy, crystals are neat and tidy. Researchers produce glass by melting a crystal, and then they cool the liquid by ensuring that the ordered crystal does not reform. The electride with C12A7 is able to form as glass at a temperature approximately 200° lower than the oxide does. This temperature is the moment when the atoms no longer flow as a liquid and freeze in place. It is referred to as the glass transition temperature. Researchers are able to control certain properties of the material by controlling the glass transition temperature. For example, the reason behind car tires wearing down and their performance in bad weather depends on the glass transition temperature of the rubber they are manufactured from. Sushko, his PNNL colleague Lewis Johnson, Hosono and others at Tokyo Tech wanted to establish why the glass transition temperature of the electride was so much lower than that of the oxide. They assumed it was due to the electron anion components of the electride. Electron anions are free moving electrons, in place of the much-larger negatively charged oxygen atoms that push the oxide to form an orderly crystal. Hosono's lab experiments were simulated by the team using molecular dynamics software. The software could trap the movement of both the atoms and the electron anions in both the glass and the melted material. 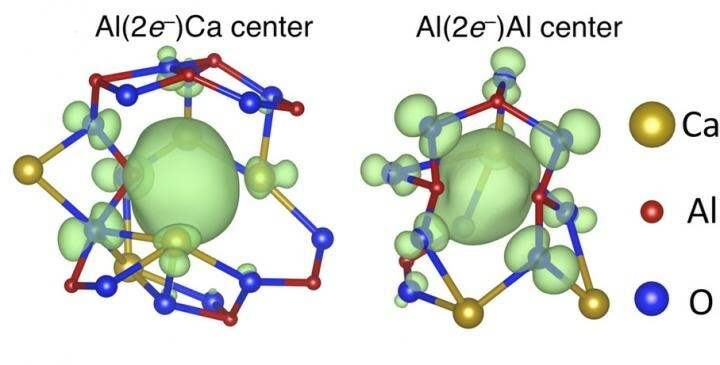 The team discovered that that the negatively-charged electron anions paired up between positively charged calcium or aluminum atoms, substituting the negatively charged oxygen atoms that would usually be found between the metals. The bonds formed by the electron anions between the metal atoms were weaker than bonds formed between oxygen and metal atoms. Furthermore, these weak links could travel quickly through the material. This movement enabled a small amount of electron anions to have a bigger impact on the glass transition temperature, than the larger amounts of minerals normally used as additives in glass. To eliminate other factors as the impetus for the reduced transition temperature - such as the change in oxygen atoms or electrical charge - the team simulated a material possessing the same composition as the C12A7 electride but with the electrons dispersed uniformly through the material rather than being packed in as electron anions. In this simulation, the glass transition temperature was the same as the C12A7 oxides. This result verified that the system of weak links produced by the electron anions was responsible for alterations to the glass transition temperature. According to the researchers, electron anions create a new type of weak link that is capable of impacting the conditions under which a material can form a glass. They join the ranks of distinctive additives that disturb the ability of the material to form weak, haphazardly oriented bonds between atoms of opposite charge, such as sodium, or to form long chains of atoms, such as fluoride. The study recommends that researchers may be able to control the transition temperature by altering the quantity of electron anions they use. This work shows us not just how a glass forms, but also gives us a new tool for how to control it. The Japan Science and Technology Agency and PNNL supported this research.